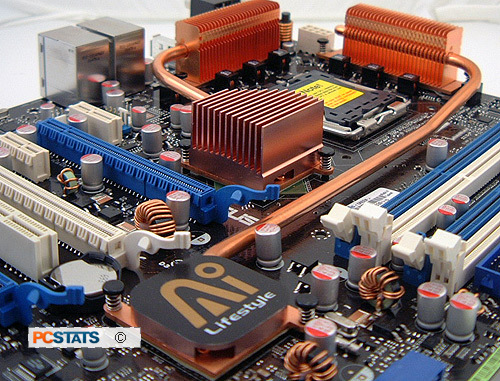 The Asus P5N32-E SLI Plus motherboard has two copper heat pipes snaking between its slots and connectors, connecting low profile passive chipset heatsinks to two sets of copper fins situated around the LGA775 CPU socket. The nVIDIA nForce 650i SLI Intel Edition chipset generates a lot of heat and thus requires more cooling than some previous nForce models did. The nForce 570i SLI MCP (southbridge) has a finless copper block heatsink mounted to it, with a heatpipe that connects it to a 28 fin copper heatsink set by the CPU socket. The nForce 650i SLI Intel Edition SPP Northbridge has a similar cooling arrangement, although the heatsink directly on top of this chipset is passively cools as well. In both cases, the heat from the chipsets is conducted to a small copper fin heatsink resting on top of the boards' MOSFETs. These two finned heatsinks work off the exhaust airflow from the CPU fan, which blows over then just enough to keep the thermal environment in check. 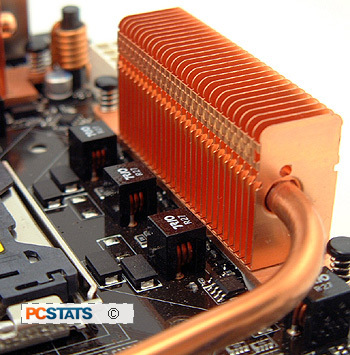 The small finned copper heatsinks on top of the MOSFETs require active cooling if the processor is cooled with a passive heatsink, water cooling system or phase change cooling. Unlike with previous motherboards, Asus does not include any squirrel cage fans with the P5N32-E SLI Plus, so you'll need to point a fan in the CPU socket's direction for those situations where CPU heatsink fan exhaust is not present.